Dr. Watson loves me. I know because he treats me so kindly, explains things so clearly, never sends a harsh word in my direction. I know because he’s willing to be vulnerable, to share his potentially embarrassing thoughts and feelings with me. He is a gentleman narrator; he is warm and welcoming; he takes me into his confidence; he expresses his love through the care he takes in his sentences. But I also know he loves me because he loves Holmes. Watson fails over and over to make the correct deductions, but he keeps trying. 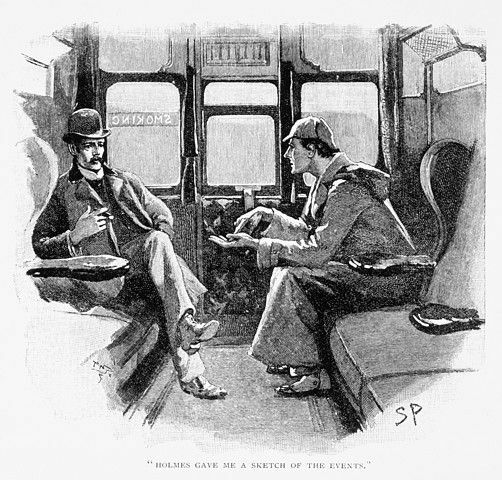 Holmes treats him callously, but Watson understands that Holmes doesn’t mean to hurt his feelings; he accepts Holmes’s intentions to teach rather than getting upset at his friend’s unskilled delivery. He treats Holmes kindly, both in person and as a narrator. Even when he is assessing Holmes’s lack of knowledge about the solar system, Watson is kind. I am unlovable in the same ways as Holmes: I am unstable and obsessive; I care only for my work; I am socially inept. (You may know me and disagree, and your view is probably more accurate, but this is what it feels like inside.) But Watson loves Holmes anyway, cares for him, lives with him joyfully (as much as possible—Holmes is annoying). And because this is fiction, everything Watson does for Holmes, he does for me, the reader. When I am lonely and sad, when I need a kind hand on my shoulder, I turn to Watson. The Sherlock Holmes stories are often repetitive in their structure, with pages of summary and not much plot. I almost never read them anymore to find out what happens or to solve the mystery. I read them to spend time with Watson, to participate in a living relationship between narrator and reader, a relationship that is no less real than Holmes and Watson’s celebrated friendship, and no less real than a relationship between two non-fictional humans. Why am I saying this? To tell you to write? Of course, yes! Write! Maybe you will write a character who becomes your reader’s true friend, or maybe you will write a story that lets your reader experience unconditional love. But I think there’s something else here, too. There are other types of narrators, and they show us different ways we can be. Chuck Palahniuk’s narrator in Survivor hates the reader and shows it. Borges’s self-narrator in “The Aleph” is so journalistic that none of his emotions reach the reader at all. Walt Whitman’s narrator in Leaves of Grass makes love to the universe in a way that is practically obscene. These people show us different ways to live, as well as different ways to tell a story. Maybe I will never allow myself to be as exuberant as Whitman; maybe I will never write a narrator like his; but he shows me that it’s okay to feel that inside myself. A first person narrator expands our idea of human experience. It lets us see more ways of being human; it lets us accept parts of ourselves we might otherwise deny. When I ask the question “How shall I live?” I always look to literature for the answer. Watson has shown me his answer, and that helps me find my own. This entry was posted in Encouragement, Reading, The Writing Life and tagged Chuck Palahniuk, fiction, friendship, Jorge Luis Borges, keep going, literature, love, narrator, Sherlock Holmes, short story, the reader, Walt Whitman, Watson by Keiko O'Leary. Bookmark the permalink.